This portico is all that remains of the Penrhyn Arms Hotel, where the University College of North Wales was based for its first few decades. The hotel was built as a coaching inn in 1799. The architect was Benjamin Wyatt, who later designed the Loyal Dispensary which still stands nearby. In the 1870s the curate of Llanedwen, Anglesey, shared a bed in the hotel with his stepdaughter. He was later sent to prison for lying about the paternity of their dead baby. In the 1880s many towns vied to become the home of the University College of North Wales. Bangor, Caernarfon, Conwy, Denbigh, Rhyl and Wrexham made the shortlist, and Bangor was chosen. Much of the funding for the new institution was raised by workers who contributed a percentage of their wages. Quarrymen alone raised more than £1,250, and there were c.8,000 subscribers in total. The Penrhyn Estate agreed to lease the hotel to the new university college for £200 per year. 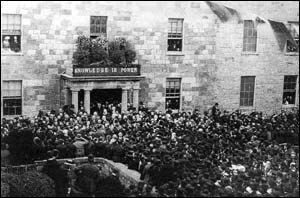 On 18 October 1884, a large crowd gathered here for the official opening (pictured right). The motto “Knowledge is Power” was displayed above the portico. There were 58 students that first year. Their library was in the former hotel kitchen and scullery, and the smoking room occupied one of the stables. Science buildings were later added. A grand new university building opened in 1911. It’s still the focalpoint of Bangor University today. Until 1926, the college continued to use the Penrhyn Arms, which was demolished when the main A5 road was diverted to run across land where the hotel had stood.